Date: May 18 2019, 7 a.m. - May 19 2019, 7 p.m.
Mount Baker is a spectacular volcano in the North Cascades that offers excellent mountaineering to beginners and experts, alike. Baker tantalizes the residents of Seattle on clear days and stuns ferry passengers in the San Juan Islands. Located only 55 km inland from sea level at Bellingham the volcano has dramatic relief. Mount Baker also achieves prominence as the 3rd highest summit in the state of Washington and as the iciest mountain in the Cascade Range. An unbelievable annual snowfall (world record of ~30 meters in 1998) sustains more than 100 square kilometers of glaciers and permanent snow fields. Consequently, crevasses are a major danger, dictating that all parties be proficient at glacier travel and rescue. Avalanche danger is commonly high because the notoriously variable weather can create unstable snow, even on moderate slopes. 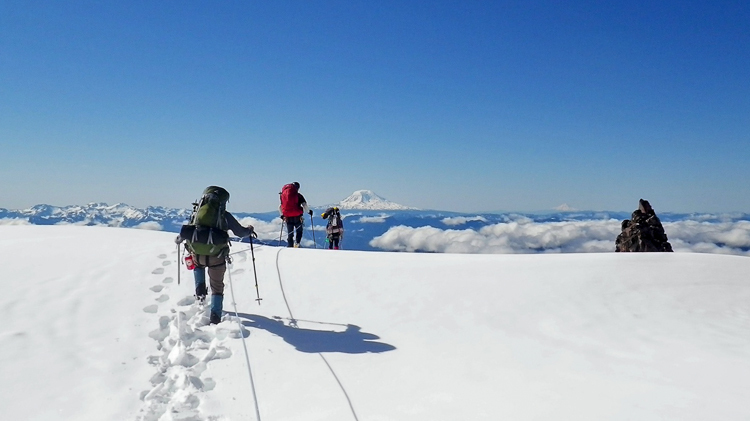 Despite these risks, Mount Baker is an excellent first volcano for those learning to climb on snow and ice. When weather and glacial conditions are right, the ascents can be straightforward and relatively non-technical. Ice fills the summit crater, creating a broad, rounded summit that allows beginners to relax and enjoy the views. *Climbs are subject to cancelation base on weather, route, permit availability, avalanche danger or lack of appropriate amount of climbers.